This combo includes Super Subtle Card Miracles DVD, Million Dollar Card Secrets DVD, and a medium sized Green Close-up Pad. 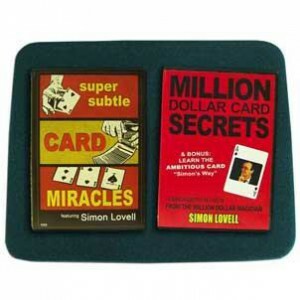 Super Subtle Card Miracles: Simon Lovell presents this DVD on easy to perform, easy to learn card magic and moves! You will learn fabulous card magic that anyone can do. Simon will also teach you these fantastic effects along with extra hints and tips that will astonish your audience. Plus you will see audience performances that will allow you to see just how amazing these card miracles really are! "This is simple, visual card magic that you will use in the real world!" - Simon Lovell Medium Size Green Close-up Pad: Neoprene backing with a beautiful gaming table surface makes these close-up pads the best in the industry. Measuring 13.75" x 10.75" (35cm x 27cm) they are the perfect size and cushion for all packet tricks! Million Dollar Card Secrets: Go inside with the “Million Dollar Magician”Simon Lovell. Simon shares more than 30 card tricks and secrets that will put you in a class above the rest. The card tricks are so secret we can’t list them! As an added bonus Simon shares his Ambitious Card Secrets to further enhance your Million Dollar Experience! An essential DVD!